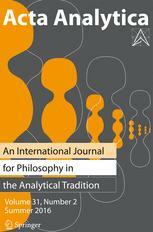 Acta Analytica is an international journal for philosophy in the analytical tradition covering a variety of philosophical topics including philosophical logic, metaphysics, epistemology, philosophy of science and philosophy of mind. Special attention is devoted to cognitive science. The journal aims to promote a rigorous, argumentative approach in philosophy.